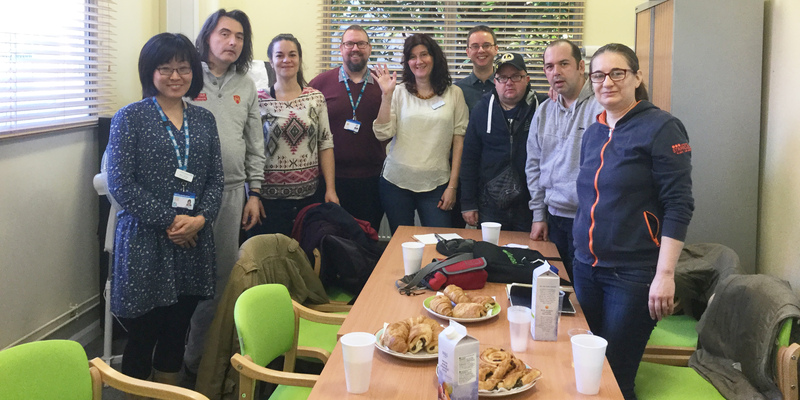 Delegates from the Western Balkans Hearing Voices Network, a group who support people who hear voices or see visions, recently visited the Recovery College to learn about their innovative projects and how co-production is embedded into their practice (pictured). The group received a presentation explaining how C&I offers recovery-focused, educational courses to the Camden and Islington community, as part of its Recovery Model, that aims to combat stigma and discrimination within mental health. Professional Tutor and Deputy Mental Health Law Hub Manager, Heston Hassett, and Peer Learning Worker, Rina Deans, explained in detail about their Recovery College roles, as well as how co-production works. This followed with a Questions and Answers session. Our Deputy Mental Health Law Manager, Heston Hassett also talked about staff training provided by the Trust, which enables colleagues to inform service users about mental health law effectively. Tutors and staff at the College also welcomed the delegates, providing valuable insight into how the College works. While in London, the delegates also had Advanced Hearing Voices training with Mind in Camden. The visit, funded by Erasmus+, took place in order for learning to be shared and disseminated in the Western Balkans Network. The delegation consisted of a group of service users and psychotherapists from Belgrade, who founded the first ever Hearing Voices peer support group in Serbia.